If you can't decide on what style of dress your bridesmaids should wear then Marks and Spencer has the answer. The new 2017 wedding collection features the Multiway Strap Maxi Dress - a stunning ankle length dress that gives you the choice on how to wear it. Your bridesmaids wear the same dress colour with a different strap arrangement. Your bridesmaids wear different dress colours with the same strap position. Your bridesmaid each wear a different colour with a different strap position. The multiway strap dress is availale in colours of blush pink, duck egg, ivory, navy and antique pink. 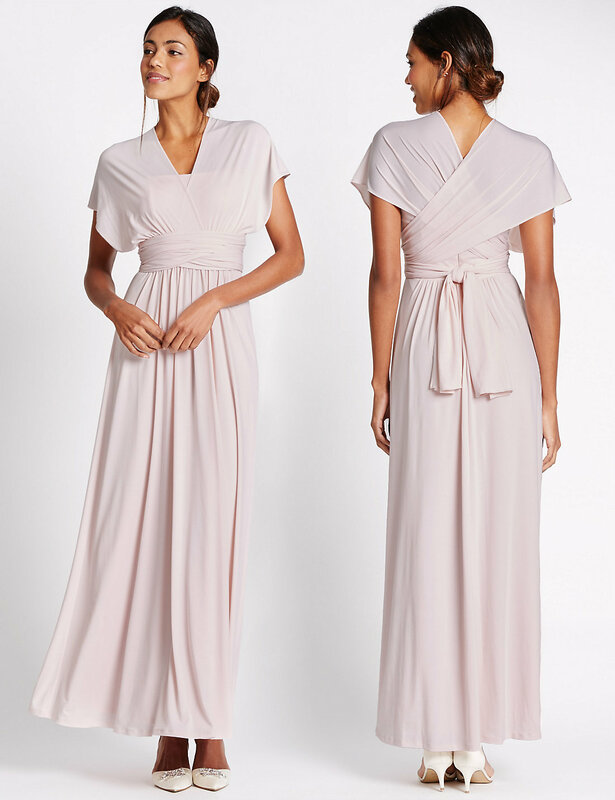 Covered Shoulders - This dress, shown here in blush pink, is elegantly understated whilst also practical when worn in this style, for protecting your bridemaids shoulders in the cooler weatther. 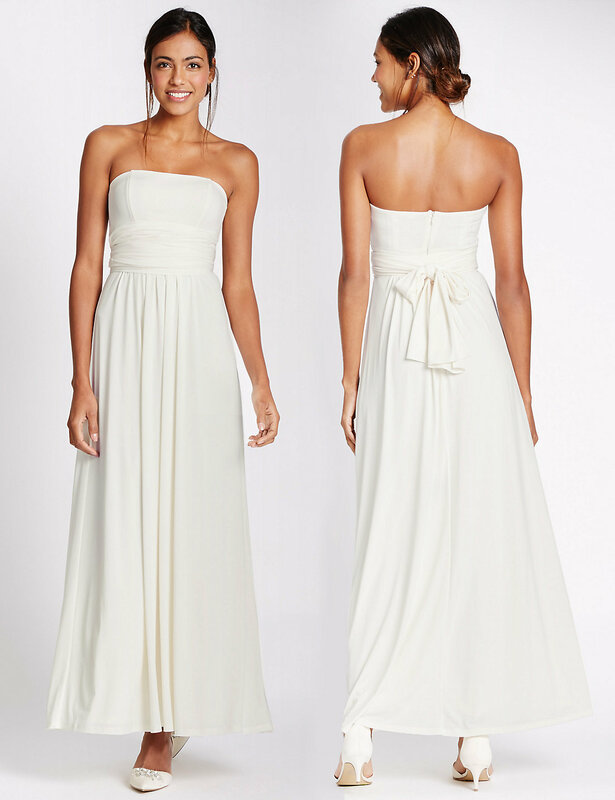 Halter Neck - This halter neck tieback of the multiway strap dress boast a holiday look - beach wedding anyone? The colour of the dress shown here is duck egg and would be stunning with yellow or purple flowers for spring, pink flowers for summer or white for a cool winter look. 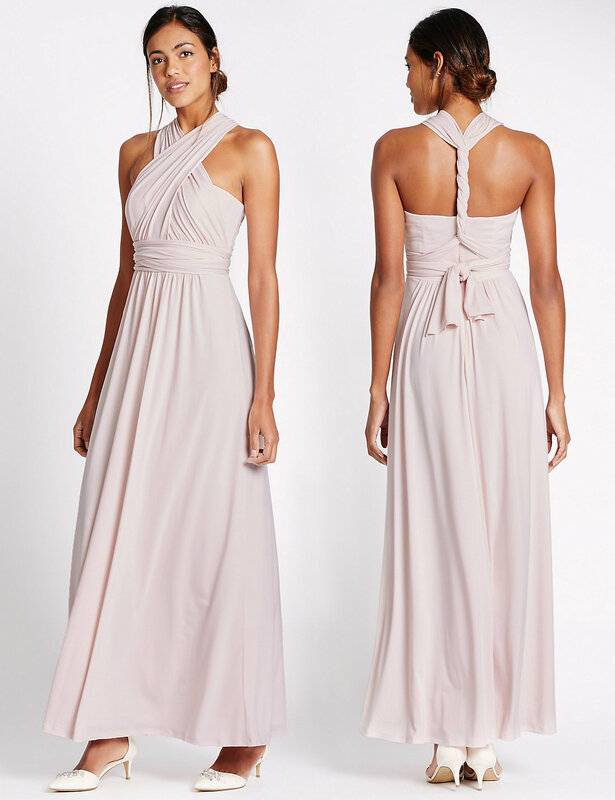 One Shoulder Strap - This off-centre strap style has a grecian look to it and we think it's best suited to summer weddings. The colour of antique pink however would look lovely for autumn weddings as an alternative to orange, brown, red and yellow. Strapless - Simply no straps is elegant on it's own. The multiway strap dress shown here in ivory is very versatile and could be used as a wedding dress as it is. Very practical it is perfect to wear all day, as a simple evening party wedding gown or for a beach ceremony. Crossback - An interesting alternaive to a plain dress back. The dress colour shown here is navy and can be worn in any season. The deep shade is sure to be flattering on most skin tones and body shapes, especially with the added stretch fabric. 'Cross My Heart' Strap - The design has the strap crossed on the chest and twisted like a rope down the back. This dress is fitted at the waist and has flare down to the hem. The model is wearing blush pink bridesmaid dress. Like the colour but need even more styles? Marks and Spencer also has the Floral Lace Strap Swing Dress, Short Sleeved Lace Skater Dress and Strapless Pleated Maxi Dress. These dress are also gorgeous and are available in the same shades as the Multiway Strap Bridesmaid Dress.